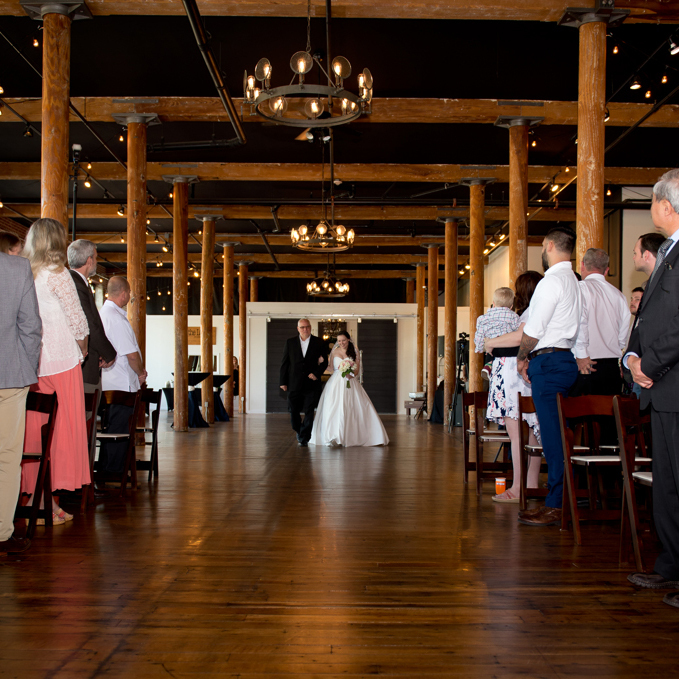 The 6,000 square foot space can accommodate events up to 250 guests for a seated event, or up to 200 for a wedding and standing cocktail style reception. The Loom is available on Friday, Saturday, and Sunday from 10am-10pm and Monday through Thursday for hourly rental with a 3-hour minimum. enjoy your event. Our full in house support team is here to handle all of the set up, take down, and clean up so that you are free to enjoy the festivities. Likewise, our directors provide assistance in choosing linens as well as total “day of” logistics. Rehearsals and the event itself are coordinated by and through the Director. They become your “hands and feet” to assure the day goes as planned. We are fortunate to have ample parking for over 250 guests with security onsite at every event to insure everyone has a good time. We provide parking attendants to help your guests with appropriate parking. We are located 5 minutes from I-385, so getting to the Loom without downtown traffic is easy. You are free to bring in your own decorations, but after touring the Loom, we feel you will find that the venue doesn’t require a lot of extras. We offer modern LED uplighting as an option to enhance your event. The lighting can be configured to any color you choose. Our Bridal Suite is situated with a two way mirror so that you can watch as your guests arrive, but they can’t see you! We go the extra mile to make sure you have what you need during the preparation for the day. Our Directors take pride in assuring you that everything is taken care of so that you can relax and enjoy your big day. We have a large experienced vendor list to choose from. You only want experienced professionals to rely on, and we’re here to help with your choices! Our kitchen is considered a prep kitchen with a commercial refrigerator, proofer, and large commercial ice machine. Our bartenders are outgoing, friendly and experienced in the service of alcohol. We do card guests to make sure we all stay within the law. For more information about The Loom, including rental rates and booking information, please download our venue rental guide.